Hi , during some testing I made a short between the 2 wires coming from fan 2 . I heard a small pop and now Fan 2 isnt' working anymore. Do you have any idea if is it possible to repair it? I can't see clearly sings of burns , my only doubt is regarding the component show in this picture. If it's only Fan2 that doesn't work then the mosfet you indicate is almost certainly blown. See https://duet3d.com/wiki/Connector_and_spare_part_numbers for replacement part numbers. 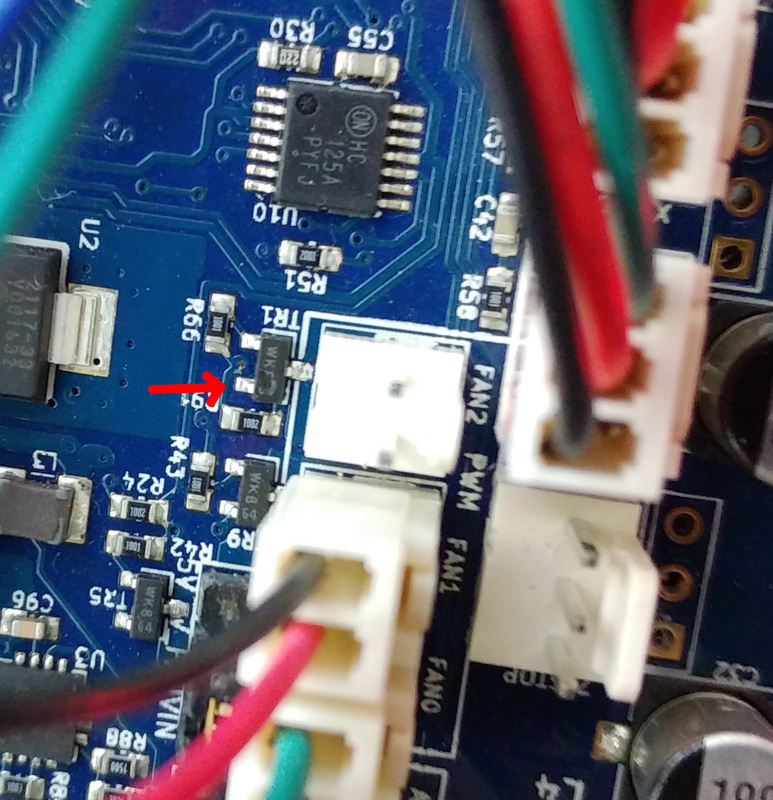 Removing TR1 from the board without damaging the PCB is difficult without hot air desoldering equipment, because you need to heat all 3 pads at the same time to avoid lifting the PCB traces. I am planning to cover all the area with heat resistent kapton adesive and then replace the mosfet. Can you suggest me the best temperature of hot air gun ? Yes that's the right mosfet. The main component you need to protect from the heat is the adjacent white Molex connector. The heat may melt the solder on adjacent components too, so lift the old mosfet off with tweezers when the solder has melted and avoid jogging the board. It's easier to use a fine tipped soldering iron to solder on the new one then to use hot air. I suggest an air temperature of about 260C to desolder the old one. A heater under the PCB isn't essential when replacing small components like that one.